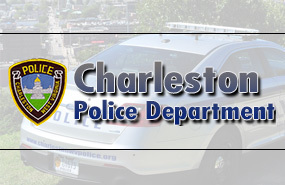 Our Goal is to make the City of Charleston a safer place to work and live in. We work in a collaborative effort with the citizens to meet those needs through programs such as Dare, Citizens Police Academy, Neighborhood Watch, and the Neighborhood Assistance Officer program. As well, we strive to make our streets and highways safer by participating in local, state and national level programs to combat impaired driving. 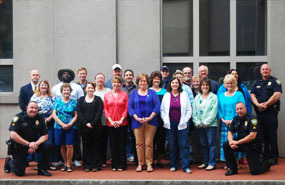 The Charleston Police Department consists of 162 sworn personnel and 21 civilian employees. Police service is provided to a community of over 50,000 residents with a coverage area of 33.3 square miles. 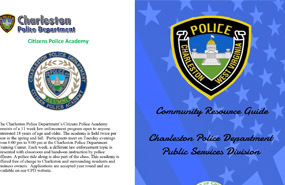 The Charleston Police Department Application for the Citizens Police Academy. Download Our Community Resource Guide for safety, contact, and general information. Employment information and opportunities with the Charleston Police Department. 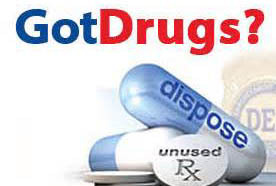 The Charleston Police Department participates in a Drug Take Back Program to help keep unwanted/unused prescription drugs off the street. 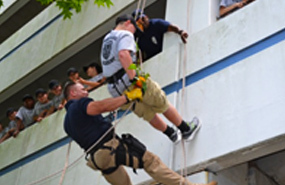 Information and Application for the Charleston Police Junior Police & Leadership Academy. 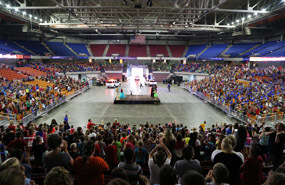 Video from the 2017 Charleston Police Department POWERAMA Event at the Charleston Civic Center.